Crafty Andy: Freedom Hat is Done! My first Double pointed Needles project, my first double pointed needles pattern! I really like DPNs. I had no idea how wonderful it would be to make hats this way. Here you have some pictures from my Knitting in public on the plane. You can actually knit on a plane with dps and regulr wooden needles. I have done it more than once and I don't think there are any problems with the American Air Rules and the TSA. 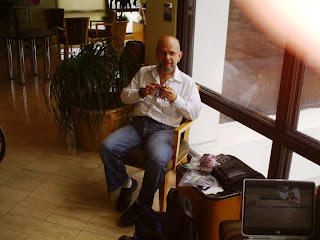 I had a chance to do some wonderful Knitting in public at the Admiral's Club Lounge. My double point fear has faded away as I struggle to find my balance with the needles. Five needles is a great balance for a project and one thing is for sure a lot of people are curious about what you are doing. It seems that people have seen a lot of people knitting, but very few people knitting with that many needles at the same time lol! The hat is finished, it is ready for the San Francisco Summer and has the 4 TH of July Colors! It was a very basic hat pattern starting with 8 stitches and then progressing to 96 stitches. I will be creating another one with this pattern soon. I decided to make the increases on every needle at a certain point then I decided that I wanted to have 8 points of increases. I guess I could have started it earlier, but this is how you learn. I ended the pattern with a cute basket weave 3 by 3 pattern. I am in love with my Harmony Double Points is all I can say and making hats is something that I enjoy and finding joy in double point needles was a great and pleasant surprise. So here I am modeling my hat with some a collector's item glass from SPOK can you imagine? I am a very happy camper, very little to please me these days. I want to thank you for allowing me in you home and hope to have more fun stuff to tell you later on. Thanks for stopping by!